← Does Good Luck Trump Good Planning? This is third in the series of my blogs addressing the intimate relationship between Project Management, Risk Management and Knowledge Management. In the first blog, I introduced the idea that the Project Manager must be a Knowledge Manager to be most effective in their job. In the second blog I highlighted the pervasiveness of knowledge management within the project manager’s responsibilities and throughout the project life cycle. In this blog I’ll describe my views on how Project Managers, whether they realize it or not, execute most of their responsibilities, within and across the quadrants of what I’ll refer to as the “knowledge domain.” My thoughts in this regard are influenced by the concepts of the “Conscious Competence Learning Model”(CCLM), and the terminology, Known-Knowns (KK)”, Known-Unknowns (KU),” Unknown-Knowns (UK)”, and “Unknown-Unknowns (UU)”, apparently coined by former U.S. Secretary of Defense, Donald Rumsfeld. What I’m offering here is a map of the activities that project managers are, or should be engaged in, to the knowledge domain quadrants defined by these concepts and terms. The figure below depicts the four quadrants, mapped to a vertical axis of Knowledge Awareness and a horizontal axis of Knowledge Adequacy. Knowledge Awareness refers to the degree to which the project manager and the team know of, or are conscious of all of the available knowledge relevant to their project. Knowledge Adequacy refers to the degree to which the project manager and the team have competency in all of the knowledge required to execute their project. In Project Management, the Known-Known (KK)/Conscious-Competence quadrant is where all of the known, relevant knowledge resources and expertise required to execute are identified, logic-linked and sequenced in a Project Plan. Projects manage risks and opportunities related to lack of or uncertainty of knowledge in the Known-Unknown (KU)/Conscious-Competency quadrant. Decisions made in this quadrant are used to update the project plan and the resource allocations. I’ve not seen much in the Project Management literature on the Unknown-Known/Unconscious Competence quadrant, but I think it must be recognized as one of the necessary knowledge management responsibilities of a Project Manager. Intellectual and fiscal resources must be planned and allocated to ensure that the project team is doing the right things to pursue and internalize additional relevant knowledge wherever it may exist. This means that one of the responsibilities of a project team must be to function as a learning organization. Knowledge acquired through these efforts will bolster the Known-Knowns area, reduce the risk in the Known-Unknowns area, and might even shine a bit of light into that dark corner of Unknown-Unknowns. Projects attempt to protect themselves from the ravages of the Unknown-Unknown (UU) quadrant by building management reserve, schedule buffers and product design margins into the project baseline plans in an attempt to accommodate the “unknowable’s” and “unpredictable”. In going through this thinking process, I realized that in addition to the similarities between the individual learning process described in the CCLM; and the goals and processes of Project Management, there are also some interesting differences that might be worth pursuing in a future blog. In the CCLM, the beginning state is “Unconscious-Incompetence” (unaware and unskilled)/UU, and the goal is to move through the other states to get to the “Unconscious-Competence” (skill is instinctive)/UK state. Projects, on the other hand, start with the “Conscious Competence”/KK state, and although they recognize the there is an “Unconscious-Incompetence”/UU quadrant, and they try to protect themselves from its ravages, they hope never to go there. Thinking through and writing this blog has been a helpful learning process for me, even though I’ll admit it’s a bit of a convoluted read. However, if you’re in to Project Management or learning theory, I hope you stuck through it to the end and would be willing to share your professional feedback. This entry was posted in Program & Knowledge Management and tagged concsious competence model, knowledge domain, learning, Project Management. Bookmark the permalink. That’s yet another excellent post on the topic of KM in PM that I would really love to republish on PM Hut. Please either email me or contact me through the “contact us” form on the PM Hut website in case you’re OK with this. Excellent post on a very important, and poorly understood, aspect of Program Management. I think it’s interesting to note that Donald Rumsfeld was ridiculed a bit for his speaking of Unknown Unknowns, yet they are very real and can end up causing a project a great deal of heartache when they suddenly, and unexpectedly, raise their ugly and, frequently, formidable heads. 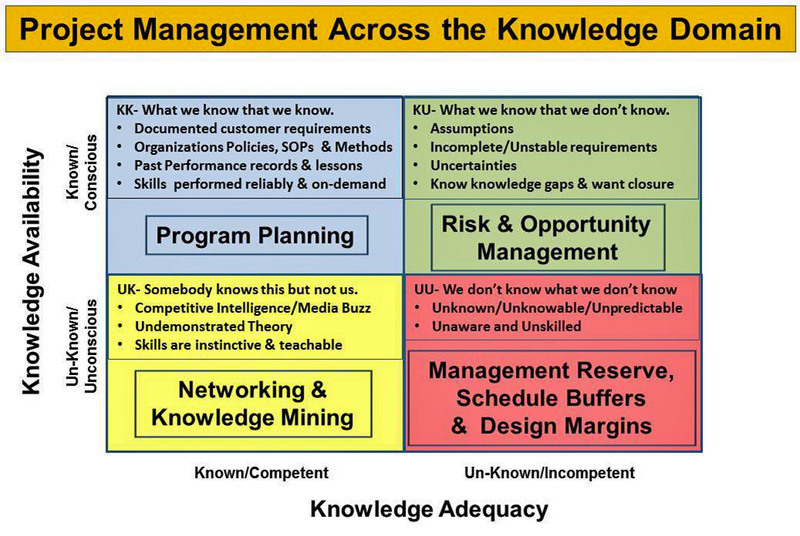 In the domain of knowledge management, I have found the KK and the UK quadrants at times bleed over a bit, most notably in the area of tacit knowledge, where frequently people don’t know what they know until they need to use it. 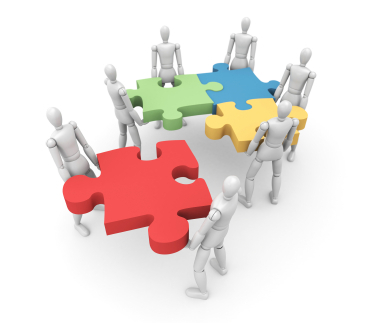 I think one of the skills a program manager needs to have (either personally or through robust KM processes built in to the team’s organization and activities) is the ability to connect the team members’ knowledge to the activities engaged in by their colleagues. As you know, one of my abiding interests is in learning how to use social media to increase that connectivity by providing channels for greater communication and collaboration, all of which (IMO) increases a team’s ability to be truly innovative, as well as more competent in doing the things they’re best at. I look forward to more of your instructive blogs. Keep it up! Absolutely outstanding! One of the best items I’ve ever read on the Internet. Your blog is one of the best and most interesting I’ve come across on the Internet. I look forward to future topics, particularly as they relate to program, project and risk management. With regard to your article on Project Management Across the Knowledge Domain, I’d like to suggest that there exists both conscious assumptions (KU) and unconscious assumptions (UU). People can’t function in life, and project managers can’t successfully manage a project, without making assumptions. For example, when you approach an intersection while driving your car and the light is green you make several assumptions. These include that the cross traffic has a red light, that the other drivers see the light is red, realize the light is red in enough time to stop, intend to stop, have the ability to apply the brakes, and that the brakes on their cars are working properly. Even though I don’t think about them each time I approach an intersection where I have a green light, would you characterize these as conscious (known) or unconscious (unknown) assumptions? 1. How do you know you know? 2. What’s the difference between thinking and knowing? Thanks for your generous and insightful comments. Your discussion topics are all great and likely each deserves it’s own blog. I agree with your thoughts on the necessity of assumptions. My thoughts on assumptions are these: Our knowledge and experience of both our personal and our business worlds allow us to build mental models of the way we should expect things around us to work. Those models are continuously taking our sensory inputs, processing them through our models and predicting outcomes or assumptions. I proceed through a green light because my model says, that given the traffic rules, and my successful experience in going through green light intersections in the past I should assume I’ll go through this one successfully as well. A bad experience might modify my model to employ, as a risk management measure, a quick glance to the left and right before proceeding. That’s a conscious recognition that not all assumptions are correct all of the time. 1) I think research has shown that people only “consciously know” some fraction of their total tacit knowledge. The sub-conscious part of their knowledge is only released when prompted when they perceive a relevant context. 2) From a mechanistic perspective, I think of thinking as a conscious and unconscious combination of integrative and transformational brain activity. It involves sensory input to the brain to interpret context, the recall of past relevant contexts and their outcomes, mental modeling of the possible outcomes of the current situation, the determination of a need for action, the selection of one of the model outcome predictions, and the commitment to action. 3) Wow…I don’t think I could even use that word in a sentence.